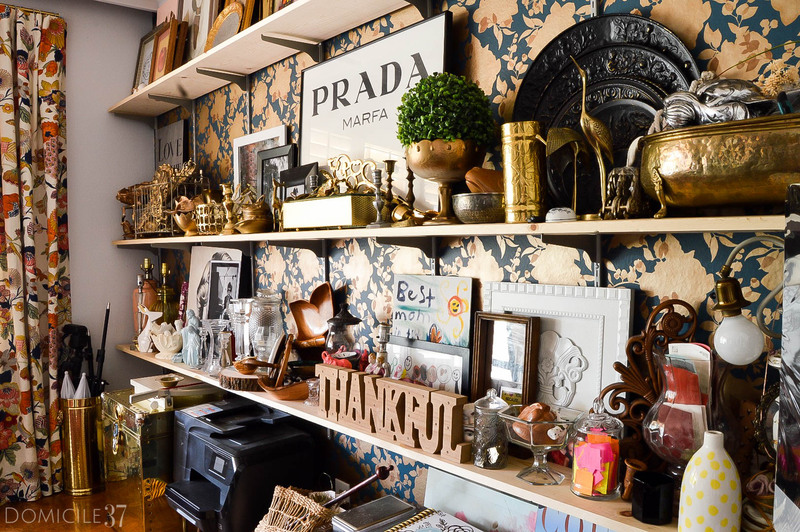 The famous interior and fashion icon Iris Apfel once said, “More is more, less is bore” and as a person who loves to hoard junk, I believe that to be true! 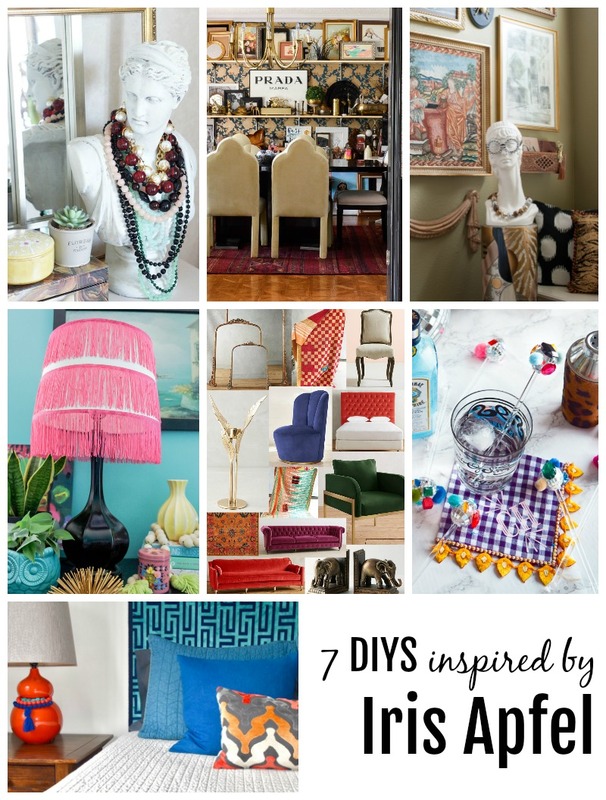 For this month’s, inspired by DIY, we decided to focus on Iris Apfel and offer tips, tricks, and projects that inspired by her. For those who do not know her, she is a New York native, a fashion/interiors icon, and a business woman. Let me not forget to mention she is also in her 90’s and still running smooth like a jet. You can check out her instagram, here! 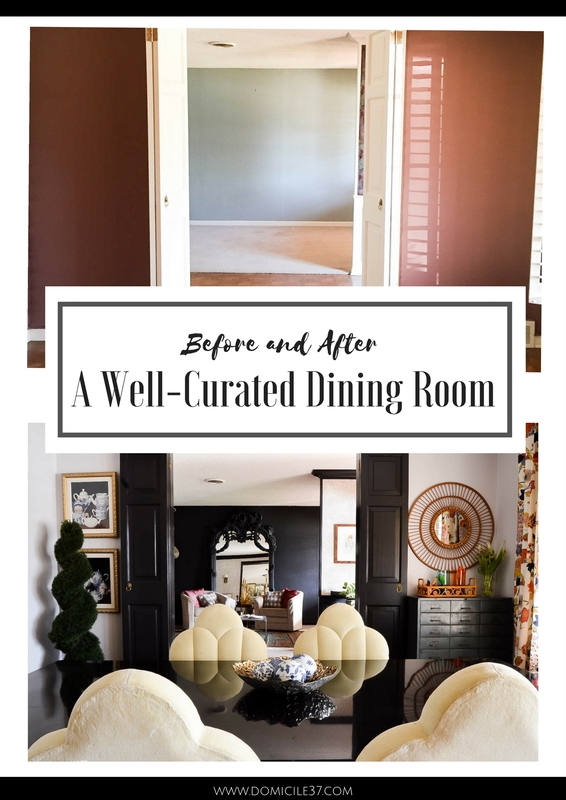 I could have whipped up a small project for this post, but since I love her layered style and gaudy home, I decided to makeover my dining room into a well-curated workspace. Let me remind you of how this space looked when we moved in. I did not think the fabric was horrible, in fact I actually liked it. It was just dirty and I had a hard time with the color. Too much purple going on. I really needed a space that I could call my own and can work without being disturbed. It also helps that this space has doors so I can close it whenever a mess is brewing. I did not know exactly what I would do with this space and kept going back and forth about whether or not I should keep or move the table elsewhere. 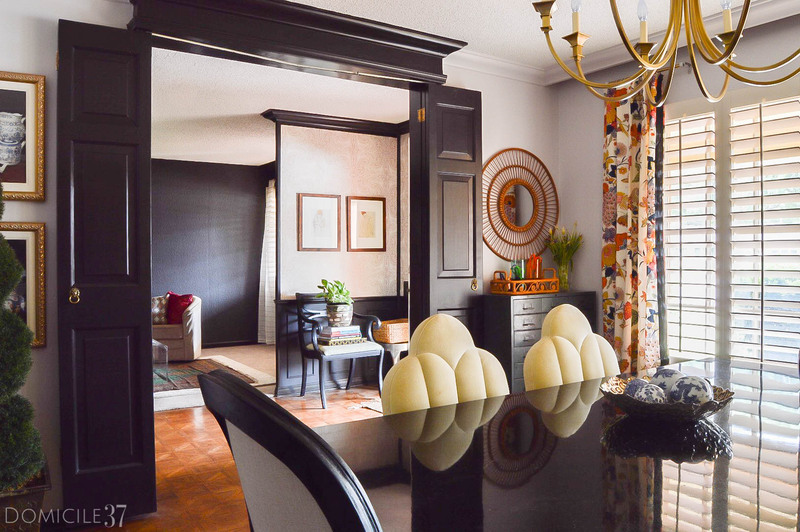 It was not until I collaborated with Tempaper that I knew what I wanted to do. I really like busy patterns and the Silhouette Peacock Blue & Gold had so much going on that I knew that it would make a nice visual statement. I added shelves to the room so that I can use them as a storage space to hold all my findings and memorabilia. I know it LOOKS rough, but I absolutely love it! The wallpaper adds the right amount of busy and all my little trinkets accents the busy quite well. 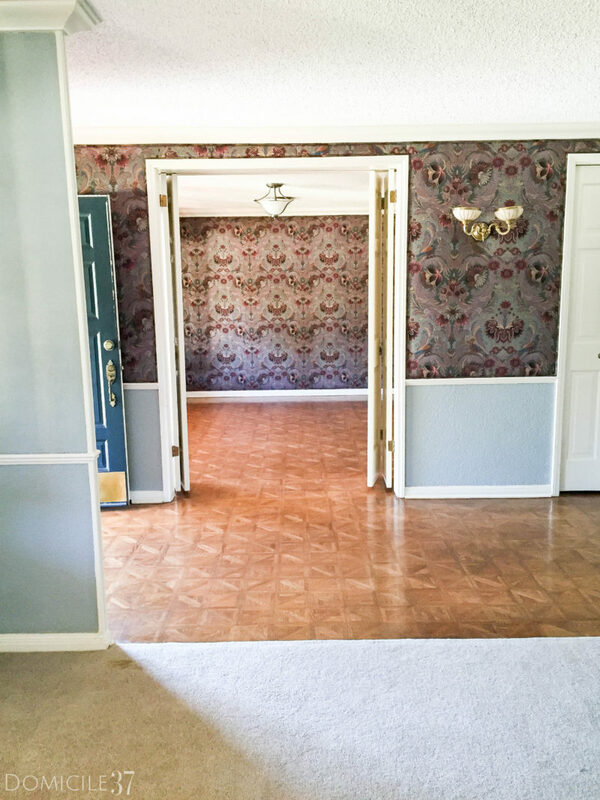 What I love most about this wall is the color of the wallpaper. The green pops and looks so good with the wallpaper and paint color in the foyer. When I watched the documentary on Iris Apfel on Netflix, the one thing I noticed was how she layered and piled on her jewelry. I love layering but I decided to keep it simple in terms of displaying my decor. Instead, I wanted to focus on the actual mixing and matching and layering of textures, patterns, and color for this space. For instance, I found some Chinoiserie balls at the thrift store and instead of placing them in clear glass bowl, I placed them in a cheetah print bowl…so unexpected and a bit wild, eh? Another example would be the curtains. 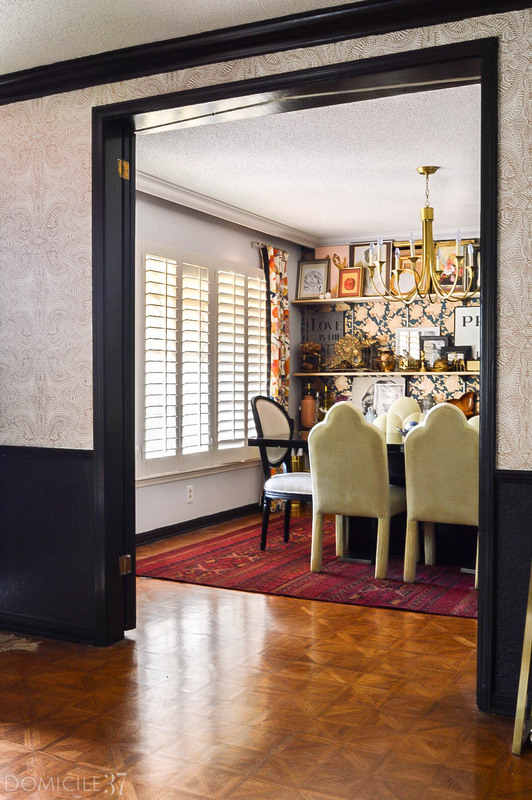 I wanted crazy in this space, so since the wallpaper is a two tone, I knew that if I brought in curtains it would be vibrant, colorful, and pattern crazy and play off of all the magic I have going on my accent wall. I felt like I could not contain 3/4 of the space and let loose the fun elsewhere. It had to be sprinkled here and there so that the vibe of the room was felt everywhere instead of just on one wall. What I love most about my workspace is how well-curated it looks and feels. Although this room was inspired by Iris, this room portrays who I am as a designer, mom, wife, and PERSON the most! It is my favorite room in the house and I can imagine myself getting lots and lots of work done in there and possibly even recording videos for all of you. jessica, this is AMAZING! seriously you blew it out of the water. i love the direction you are taking in this house. Oh my goodness, Jess! That incredible wallpapered backdrop layered with all your beautiful finds just makes my heart sing! Everything looks amazing in here! And I’m still in love with those chairs!!! The wallpaper is such a pretty backdrop! I love the layered look you have going in here! So inspiring! 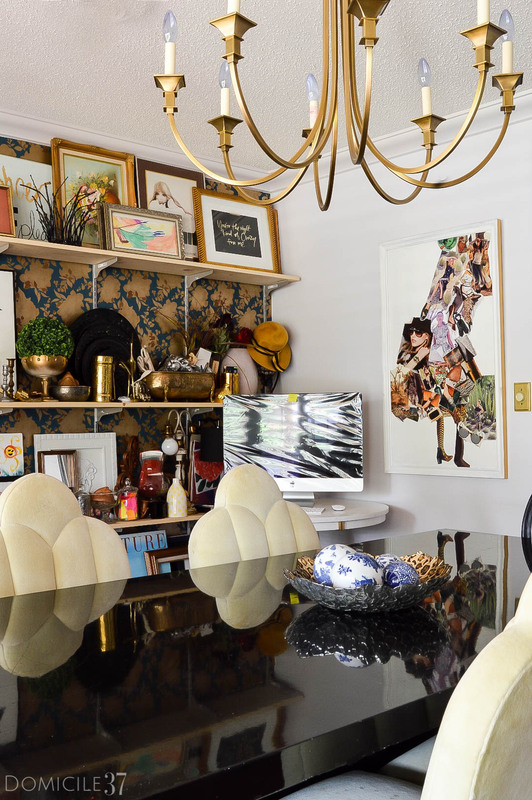 I have serious workspace envy right now- The black, the trim, the wallpaper, the gold accents, the layering, the upholstered chairs… Everything is gorgeous girl!!! Your home is looking better and better every day! OH my gosh Jess, that wall would be an amazing backdrop for some videos!! I love how it portrays your style and vibe and the patterns and layering are so smart. Gorgeous interpretation of Iris Apfel’s iconic style. The table looks perfect in there and what a fabulous workspace. It’s wonderful!!! Love the shelving and all those goodies on them. It’s like a boutique in there and what a GREAT space to work in. I wish my office was half as cool as this! 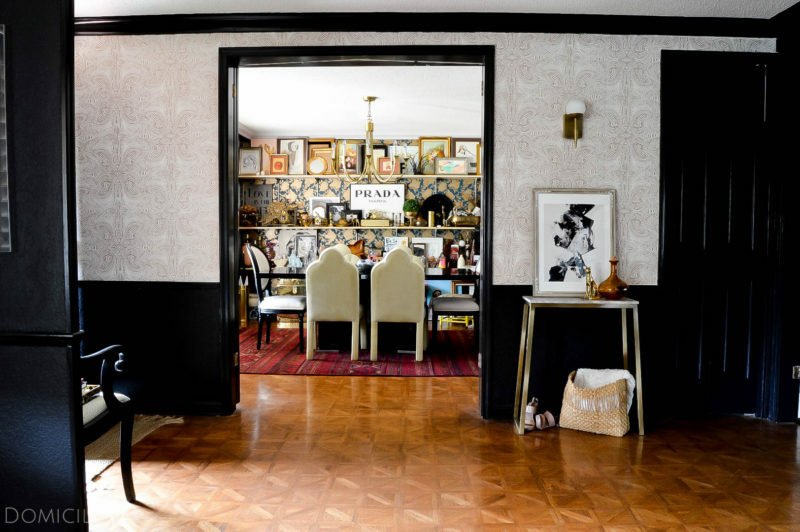 I love the maximalist styling on the shelves. Pinned! Thanks! I think we all wished we had something someone else has. I love your office as well! i am a large fan of your web sites and constantly watching all the article of your blogs. most of these posts and blogs which is associated by way of modern day style and fashion are exquisite and outstanding and conclusions. this kind of exceptional and first rate activity and thank you for sharing.